about ten years ago (she watched him on television!) and we finally went to his restaurant 'Fifteen' two or three years later. Despite the fact that he is a very shrewd business man and is now quite wealthy, I also think he is a deeply sincere, good person, and I'm glad he's won the TED prize. In fact, I think the 21 minute TED video alone--I bet it will go viral--will do more good than the years and years of boring 'food pyramid' charts ever have. 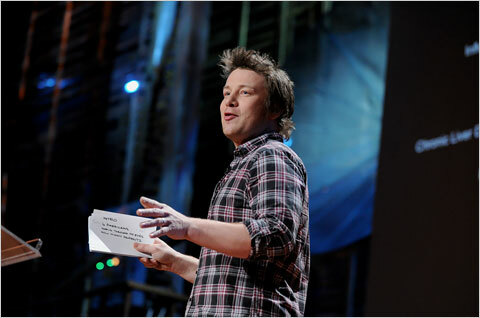 Jamie Oliver, the chef who prodded the British government to overhaul the nation’s school lunch program, was awarded the $100,000 TED Prize on Wednesday at the annual TED conference, a series of lectures by experts from a wide range of fields including science, religion, and economics. In front of more than 1,500 people in Long Beach, Calif.. and millions more who watched live over CNN.com, Mr. Oliver challenged his listeners to work with him. The prize comes with organizational support, largely drawn from the resources of people who attend this week’s conference. Among the things that Mr. Oliver’s campaign would need: office space, equipment to run community kitchens, media support, a Web site, and corporate partners who would help champion healthier food label. Following TED tradition, audience members stood up and offered their help and suggestions: headhunting for staff members, access to lawmakers in Washington, Web site design and marketing testing. His mission dovetails with Michelle Obama’s new initiative to combat childhood obesity, a problem that now affects nearly one in three children in the country. Pacing on the stage in a plaid shirt and his trademark spiky haircut, Mr. Oliver became emotional in explaining that this generation of children is projected to have a shorter life expectancy than their parents, by as much as full decade — which he argued is almost all entirely diet-related. Mr. Oliver had already established a beach head in the United States in Huntington, W. Va., statistically one of the most unhealthy communities in the country. His alternatingly humorous and emotional efforts to convert the community into eating better are documented in a series, “Jamie Oliver’s Food Revolution,” which will be shown by ABC starting on March 26. In one clip from the program, schoolchildren misidentified tomatoes for potatoes, an eggplant for a pear and a beet for an onion. Mr. Oliver said that they did not know the vegetables because they do not cook with them. A month later, TED, whose large annual conference in Long Beach attracts influential people across a range of industries, called and offered him the prize. Winners of the four previous TED Prizes, which were introduced in 2005, have included Bill Clinton, Dave Eggers and Bono. In past years, there were three winners announced at each conference. But this year the organization decided to scale down to just one, as the number of wish campaigns was becoming unwieldy. What tastes better than cardboard? Sweet cardboard! After being told by customers that their food tasted like paper products, Domino's announced, in a painfully earnest mea culpa ad campaign, that it was revitalizing its pizza, featuring a new, sweeter sauce. A company on the ropes, losing money for six straight quarters, was confident banking its future on sauce that tastes more like candy than it already did. But just a week before Domino's announced its "Pizza Turnaround," General Mills took out a full-page ad in The New York Times to announce that it would, at some uncertain point, lower the sugar content in its cereal to "single digit" levels. The two campaigns illustrate our complicated relationship with sugar. There is a big psychological difference between "sweetness" and "sugar." Sweetness is good. It tastes good, and it feels good, going all the way back to our reptilian brains. But our nutritional superego constantly battles our sweet-toothed id: Sugar is bad, it's tooth decay and empty calories. We call in a seemingly endless string of substitutes, from rat-killing chemicals to low-glycemic-index nectars, to exorcise the demon of sugar from the deliciousness of sweet things. Regardless of everything we have learned, however, our food just keeps getting sweeter and more sugary. According to a report from the Times of London, many of the foods we buy are markedly sweeter than they were 30 years ago -- cereal, bread, soup and even fruit. Sweetness has always been a sign of caloric energy, so it makes sense that we evolved to want it. But why do our tastes seem to be tilting ever more in its direction, even with calories so readily available to us? To find out, we talked to Brian Wansink, head of the Cornell University Food and Brand Lab , and author of the book "Mindless Eating," an investigation of what we eat and why. Salon talked to Wansink about corn syrup, conspiracy theories and what happens when trendy vilification is the hallmark of our attitude toward nutrition. Domino's sauce is just one of many savory-sweet foods on the market now. It's common to see flavors like "caramelized onion" and "sweet chili." Does the savory-sweet combo make foods more appealing? Definitely. What goes on is something called "sensory-specific satiety." It means that if you eat lots and lots of handfuls of popcorn, eventually you're going to get tired of eating popcorn. And if you eat M&M after M&M, eventually you get tired of eating M&Ms. But if you dump a handful of M&Ms into the popcorn, you can eat a ton. Combining the sweet and savory stimulates people into wanting to keep eating because their taste buds don't burn out. But even though it tastes good, we know that sugar is bad for us. Why isn't our increased nutritional awareness bringing down the sugar levels in food? Well, one reason was our vilification of fat. We did an environmental scan of over 370 of the most popular snack food products and what we found was, when they went to low-fat, the average calorie level only dropped by 11 percent because they replaced fat with sugar. That's just ridiculous! If you were to ask most people how many fewer calories are in something that's labeled low-fat, the majority of people will say between 40-50 percent. Studies show that people end up eating more of something if they think it's low-fat, and even if it is low-fat, they end up eating more total calories as a result. And what about all the super-sweet protein bars out there, which are marketed as a healthy food? Isn't that fundamentally wrong? The thing is, there was a kind of witch-hunting phase where we demonized sugar back in the late '80s. But if you look at it, there's a really nice case to be made for sugar. Let's use chocolate milk as an example. If you're trying to get kids to drink milk, and you add just a little more chocolate and a little more sugar, and add 30 more calories to it, you know, I don't really think that's bad compared to them ordering Goofy Grape punch with the same number of calories and really nothing in it. I think the same thing with Powerbars. If adding the sugar makes the high concentration of protein a little more stomach-able, I'm not so sure that's a bad thing. People eat more protein, it sticks with them longer, they have fewer subsequent cravings for food, and if the cost is a few spoonfuls of sugar, I'm not so sure that's such a bad cost. But the more sugar we eat, the more we need in order to taste it. Are we raising kids who have a super-high tolerance for sugar? It's called adaptation levels, whether it's the amount of sugar we put on anything or the amount of salt, or Tabasco. People get acclimated to a certain level of stimulation, and below that, stuff just tastes boring. So that becomes the new benchmark they need to sort of respond to whenever they season their food. The Times of London article claims that food scientists are breeding fruits and vegetables to be sweeter, so even our baseline understanding of what's "naturally" sweet is changing. Is that true? You know, it's cool because it has the sniff of conspiracy to it, it's like "Ooh I think I found something!" but the stuff is so mixed it's hard to be really sure. I know data that says yes and data that says no. Speaking of conspiracy theories, there are a lot of people, including Michael Pollan, who blame our increased tolerance for sweetness on high-fructose corn syrup and the power of corn lobbies over the food industry. Do you believe them? I don't know that it's the problem with sweetness. There's a reason why corn syrup is a substitute -- because it's cheaper. When people go, "Oh, we need to go all organic!" I think, gee whiz, who's gonna starve? It's not going to be you, Mr. Rich Yuppie. It's gonna be somebody else. I'm frightened to think what the unintended consequence would be of going back to cane sugar as a sweetener for everything. I have read studies that show that people eat more sweets when they're stressed. We're in a recession. People are worried about money, and Domino's is known for being inexpensive. Does our general stress level contribute to the appeal of sweeter pizza? We're doing a really cool study where we're looking at the sales of healthy and unhealthy foods across Cornell University based on exam time versus non-exam time, and the effect is less than you think. The junk food definitely goes up during exams, but what we find, surprisingly, is that in the weeks after exams there's a reversion that ends up almost wiping out the effects. The studies of "mood & food" stuff tend to be very episodic. It ends up being like, "OK, what we're going to do is we're going to run in and tell half the people in this room that their grandmother just died, and then we're gonna see how much they eat." This doesn't look at whether there is any compensation or any sort of bounce-back effect that takes place afterwards. And the studies that do look at this stuff longitudinally show that there ends up being this kind of recompensation that occurs, except in the most bizarrely artificial situations, which tend to be the ones reported. Do you think Domino's will succeed with its new pizza? What is a typical person who orders Domino's? It's not your nutritionist, it's not your activist. 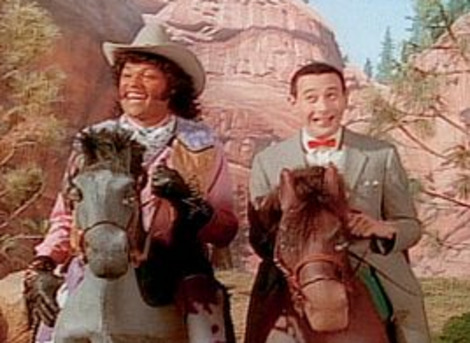 It's your typical American, and your typical American goes, "Man! Sweeter sauce! This is good stuff!" We recently had an emergency, a surprise guest, and I've got a Domino's box within 10 feet of my recycling right now. I saw this interview earlier today and looked up this guy's book and website. Interesting ideas, entertainingly presented. Thanks for posting, John. Jamie Olver did a whole season of programmes about teaching kids to eat well and also getting sign up from local auhorities for the school dinners to be healthy but tasty. It was called Jamie's School Dinners - it was very good. He's a bit of national treasure over here! It's just criminal the way food manufacturers will advertise their foods as low-fat when they are chock full of sugar, chemicals, and calories, and then people buy it because they mistakenly think low-fat means low-calorie!! You're right on that. People need to train themselves to read the labels and ingredients when buying food. 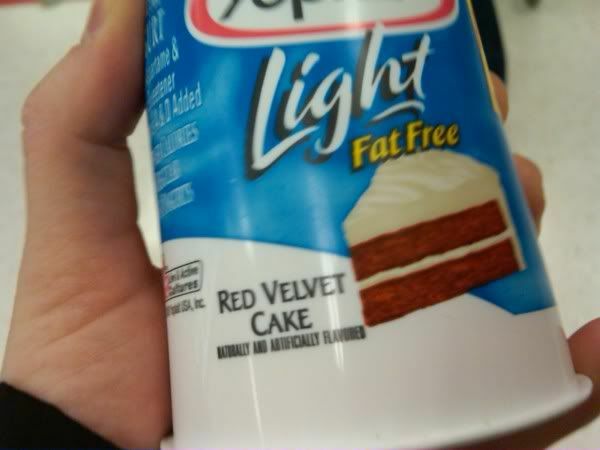 I don't buy "low fat" stuff without checking the ingredient list and the caloric content. Tomorrow starts Lent. For the next 40 days you're supposed to sacrifice something to commemorate the 40 days that Jesus fasted in the desert. What I'm going to do is buy two cans of food to donate to the church for the poor. For myself, I've decided that I will sacrifice my free time, and for the next 40 days, work out 3 times a day, as a piece of self-improvement, and see if I can kickstart my weight loss again. 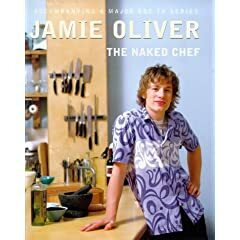 I enjoyed watching Jamie Oliver when his "Naked Chef" program was on the Food Network. He's a fascinating guy, intelligent and fun to watch! Good for you, Chuck! My mom's church operates a large food pantry and they've had a huge increase in the number of those in need. Wow - three times a day? I'm impressed. I'm having a hard enough time sticking to once a day. I do, and Yoplait has a good variety of flavors. They have orange creamsicle, cinnamon roll, key lime pie, and others. And now there's a new flavor. I'm not a big fan of yogurt, but I do like the Mountain High Original Plain yogurt which reminds me of the delicious breakfasts I had while staying in the Jungfrau Mountains of Switzerland. Only there, the cows probably line up behind the hotel to be milked just before breakfast each morning! I usually eat the yogurt in a parfait with a little granola or Grape Nuts cereal and lots of berries, fruit, or bananas.